I did some research a while back for best options for controlling dew on my Celestron C6 SCT scope, and also recently a friend asked for some advice. These are sites I like generally, I buy from them and they often have good deals…. and of course always worth checking Amazon/Ebay. Some links to dew controller bands and control boxes. I got a simple 2 port dew controller box from Ebay…. These were originally priced at £27, then I bought mine at £29, now they’ve gone up to £35, bloomin cheek! generally they have 17Ah lead acid batteries ie. 1amp will be supplied for 17hours, 2amps for 8.5hrs, and considering dew controllers eat power up when you’re using several dew controllers at once, mine use about 3amps, your power might go in 4 or 5 hours. Units with higher Ah rating and more features really jump up in price, e.g £70-£300!! Maplin also do all kinds of very nice looking power units (with meters, USB sockets, lights, cooling fans, posh looking), which are tempting but I think its much better to go for the simpler option of buying 2 x £25 units than one £99 unit! Because …..I’ve had problems where my scope and dew controllers were plugged into just one battery unit. Problem is that as the battery drains, the voltage drops a bit, and although the scope doesn’t require much amperage, the drop in voltage can cause the scopes motor control electronics to pack in/reset, at which point you can say bye bye to an observing session, because your star alignment has gone. So I have got 2 battery packs, one dedicated to scope, etc, and one solely for dew control. If your dew control battery runs out, well you still have maybe half hour or more before dew starts forming again and meanwhile the scope keeps running ok. Otherwise when at home I use the Maplin 240v to 12v unit for uninterrupted power. I don’t think I have mentioned before that I’ve got an astronomers jacket made in the USA by a firm called Dark Skies Apparel. It is brilliant, and probably one of the most useful astronomy “accessories” I have purchased. Made out of thick black cotton material (totally light-proof), it is deliberately oversized to go over your normal coat as the outermost layer. It has loads of deep pockets of varying sizes to hold my glasses, eyepieces, barlows, end-caps, red-light, etc. However the most important part is a huge klu-klux-klan style hoodie which goes over your head when at the eyepiece, and dangles down around your head considerably. The point of this is it cuts out any stray side-light (e.g. from street lamps, garden lights, neighbours security light, and so on) from around your head entirely, and this really makes a big difference when at the scope or binoculars, and also helps keep your head warm on cold nights. Ha ha ha ha ha! Take that you spammers! I’m fed up with your stupid, meaningless, generic, foreign drivel posted as comments on my blog. Goodbye, you can stop wasting my time now. I’ve just installed the Math Comment Spam Protection Wordpress plugin for Wordpress version 2.6 and up, to prevent annoying spambots automatically submitting useless comments to my blog. It’s a pity that real people now have to enter a small bit of extra info (answer for a simple sum) when posting a comment (instead of a CAPTCHA). Comment spam to my blog has been increasing more and more in intensity over the last 2 or 3 months, from spammers wanting to get backlinks from blogs to their sites, and frankly I’m quite fed up with it. Akismet does quite a good job, but still a few slip through, and you still have to tell Akismet to clean out the spam. Thing is that Akismet does not prevent comments from automated spambots, whereas asking some kind of additional question on the Comment form at least requires some intelligence on the part of the person filling in the comment, and proves that they are a real person. The Math Comment Spam Protection plug-in fulfils that requirement. If people are genuinely interested enough in my blog and enjoy or find useful the information I provide on it, then they hopefully won’t mind taking the extra time to fill in the maths question and contribute to this blog. It’s nice to receive real comments from folk, discussing or asking questions relevant to the topic of the post. Anyway, this should do the trick! Comments always welcome from REAL people with REAL interest. Rant over, I feel better now, and hopefully other bloggers might find this post useful as well. This image taken with my LX-modded SPC900NC on my C6-SGT XLT scope on EQ5 mount is far superior than I have taken of M42 in the past with my XT10i dobsonian and SPC900NC webcam before it was modified in any way. 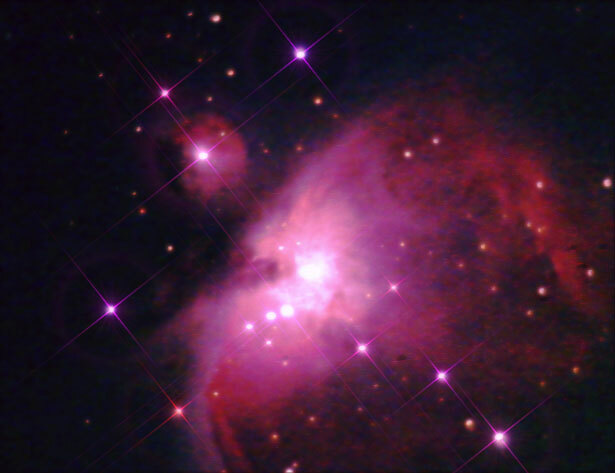 To my amusement I can make out the imaginary shape of a baboon in this image of M42! 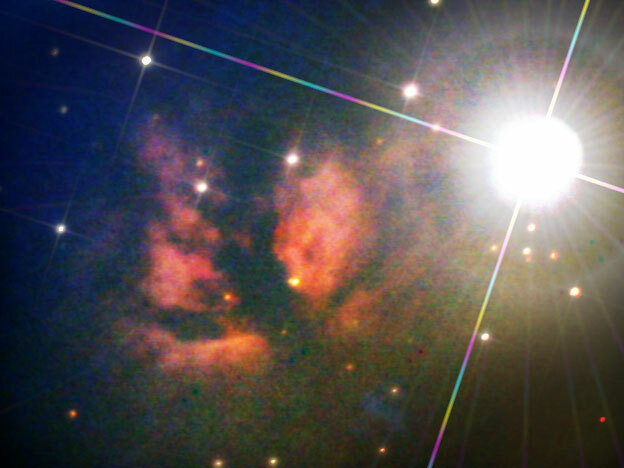 Looking at the upper right section of the image there are 2 stars which look like eyes, and typically baboon like eyebrows, and then slightly below and right in the darker red nebulosity is the downturned shape of his pouting mouth. Then expanding outwards around this you can imagine the outlines of his face, shoulders, and crouched down back. Can you see what I mean? The webcam electronics normally use an “amplifier” to increase the captured light data at fast frame rates when the camera is used in normal video mode. But when the camera has been modified to allow long exposures exceeding a couple of minutes for astrophotography purposes, and the images captured are post-processed to increase levels, a blue-white “glow” becomes apparent as a bright patch in the top left of the images, which gradually diminishes towards the bottom right. 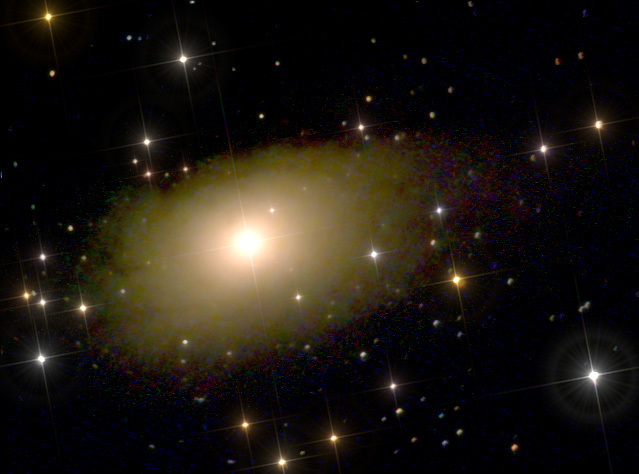 The Amp-OFF mod allows a laptop to switch off the amplifier circuit for the duration of each long exposure, so removing this glow from the data, and this greatly improves images of nebulae and galaxies that require more extreme increases in Levels/Brightness/Curves, etc in image processing software. This time around I have taken the circuit boards out of the original casing (last time I managed to cram it back into the original webcam body which was a tight squeeze with the extra wires and circuit board), instead installing everything into a much larger project box from Maplin Electronics, which makes it far easier to work with. At the same time, I removed the circuitry I had previously used to implement the serial interface for my laptop to control the long exposure switching (based around a 4066 CMOS chip), and replaced it with a much simpler circuit comprised of a few transistors, diodes, resistors. This circuit board uses the USB to serial adaptor connection RTS and DTR signals to control both the LX-Mod and the Amp-Off mod. Another advantage to using the bigger project box, is that a miniature computer cooling fan can be mounted on the lid to force cooled air over the webcam circuit board where the CCD chip is located. This helps keep the components cool, so reducing the amount of electronic noise and hot-pixels that can appear in long exposures (some people go so far as to use a peltier semiconductor chip cooling device to act as a heatsink to take the CCD chip temperature down to freezing, but this can be prone to causing condensation forming and freezing on the circuitry). Once the construction was completed, I tested that everything works correctly, and it does! Making the Amp-off mod was fairly easy to do, and I can’t think why I didn’t do both mods at the same time and put them into a larger box the first time around. Being a first try, I suppose it’s not too bad, but there are a couple of things wrong with the photograph, and it serves as a useful learning lesson for me. The main thing is that M31 covers a huge area of the night sky, and because the SPC900NC has only a small chip size, it struggles when used on such large objects in the sky, and this was even with my f/3.3 Meade focal reducer to try and increase the field of view. In effect this is a photo of just the bright central core. Next, is that my exposures were either not long enough, or that the camera settings (Gain, Gamma, Brightness/Contrast, etc), could have been tweaked while observing the Histogram graph in WxAstrocapture to improve the amount of data captured and hence get a better signal-to-noise ratio. Definitely many more images should have been captured and stacked. When post-processing the image to remove the sky-glow, and using levels to improve the contrast, I have ended up removing too much detail. Really I should have referred to a pro image of M31 to compare how much sky area my image covered before starting the post-processing. By not doing so I have inadvertently cut-off the very faint halo of the galaxy around about the distance of where the first distinctive darker lanes of its spiral begin (this is where the outer edges of the core cut-off quite suddenly in my picture), and therefore none of the delicate halo shows from this point outward. Last night a friend and her two daughters aged 10 and 12 came to stay with us for a few days with my wife for some girly shopping as they are on their half term break, and being as their dad wasn’t able to come this time, I was left to do my own thing and so I set up my telescope in the garden before it got too dark. The early evening sky was looking very promising, completely cloud free and quite bright. While setting up the scope in the dusk I noticed a bright light coming up over the horizon, and immediately recognised it’s fast, silent approach as being the International Space Station, so I dashed indoors and said to the girls that if they wanted to see the ISS they would need to hurry. At first they were not keen as they thought it meant looking through the telescope out in the cold, but I said, no, you’ve only got about 1 minute to see this! So they ran outside and watched its Jupiter-size bright light move across the sky, and then slowly wane and disappear into the earths shadow as I explained what it was, and how big it was, how high up it was and that there were several astronauts inside it. For young girls they were “kind of” impressed, but when we went back inside I fired up the laptop and Googled some images showing an external view of the ISS, and then went to Youtube to show them a video tour of the inside of the space station. That did the trick! It gave them a real “Wow” moment of what it was they had just witnessed. Later after tea, I went back out to enjoy a nice nights observing, but by the time I had done a 3-star alignment on my C6-SGT scope, as Sods Law would have it, a thin layer of cloud had rolled in. From clear sky to complete cover in just 10 minutes. Groan!! Despite waiting an hour or so to see if the sky would improve, the clouds just got thicker and thicker and I ended up packing everything away again. So frustrating. Oh well, at least we had seen the Space Station. In professional photographs The Flame looks reasonably bright when compared to very faint nebula like the Horsehead, and it doesn’t look that much fainter than parts of the great Orion Nebula (M42), which I can easily observe with the XT10i. So when I recently got my C6-SGT SCT telescope working with my SPC900NC webcam I thought it would be interesting to see if it was sensitive enough to capture The Flame, and below you can see the result. The Flame Nebula (NGC 2024) is an emission nebula in the constellation Orion. It is about 900 to 1,500 light-years away. The bright star Alnitak (ζ Ori), which is the easternmost star in Orion’s Belt, shines energetic ultraviolet light into the Flame and this ejects electrons away from the great clouds of hydrogen gas that reside there. The glow results when the electrons and ionized hydrogen recombine. Dark gas and dust lies in front of the bright part of the nebula which causes the dark network that appears in the center of the glowing gas. Out of interest I have tried Googling for images of The Flame that other amateurs might have taken using an SPC900NC, but generally all results I have found are where people are using this webcam only for auto-guiding on a bright star, and instead have used a DSLR or expensive CCD camera for the actual image. Of course their images are superior in quality, but I would be interested to know whether anyone else has captured the Flame with an SPC900NC? 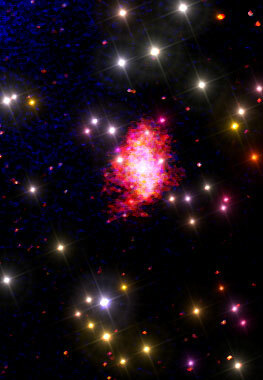 The Crab Nebula (M1/NGC1952) is found in the constellation Taurus. It is a supernova remnant and pulsar wind nebula observed by John Bevis in 1731 which corresponds to a bright supernova recorded by Chinese and Arab astronomers in 1054. The Crab is located at a distance of about 6,500 light-years from Earth, and the nebula has a diameter of 11 light-years and expands roughly at 1,500 kilometers per second. At the center of the nebula lies the Crab Pulsar, a neutron star just 28–30 km across, which emits pulses of radiation from gamma rays to radio waves with a spin rate of 30.2 times per second. The nebula was the first astronomical object identified with a historical supernova explosion. This is my first attempt at imaging the Crab Nebula, and although I am pleased with it, I think it is perhaps a little overcooked in terms of the enhancing I have done with Photoshop. I think this is because I didn’t stack enough images, nor did I use long enough exposures. I captured 12 x 120 second images using WxAstrocapture, but due to periodic errors on the worm gear that drives my EQ mount, 4 of these had shifted/elongated stars making them useless for including in the stacking. I had polar aligned as accurately as possible (but not drift aligned, and have not yet got the necessary kit for auto-guiding), so 2 minutes was about the maximum exposure I could run, as beyond this the image was starting to produce oval shaped stars. 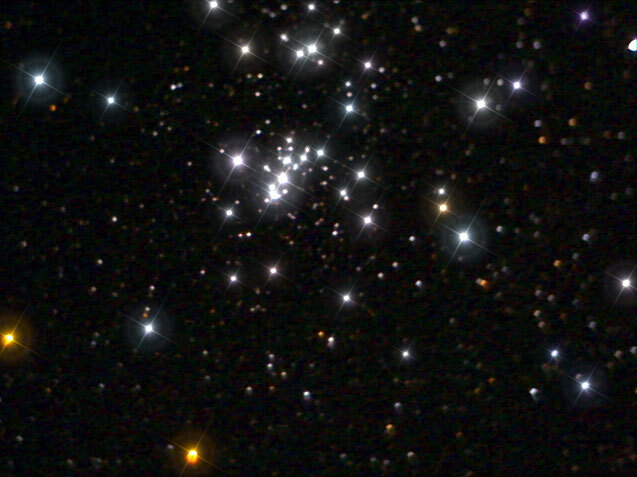 What this meant was that the data in the image was very weak, and so using Nebulosity and Photoshop to draw out the detail and colour resulted in a slightly false or cartoony look (certainly when compared to other peoples images of M1). No matter, I think its not too bad for a first go and using a cheap webcam.